Happy Holidays from the CALE team! Now that Christmas is drawing near, we would like to take the opportunity to send you our best wishes for the festive season. It has been an exciting year for the CALE team. The team members presented studies using data from the Corpus of Academic Learner English at a number of international conferences. Marcus Callies, Ekaterina Zaytseva, and Leonie Wiemeyer presented at the 36th ICAME conference in Trier, Germany; Alexandra Kinne, Tonia Sperling, and Ekaterina Zaytseva gave talks at the International Pragmatics Conference (IPra) 2015 in Antwerp, Belgium; and Marcus Callies, Alexandra Kinne, Leonie Wiemeyer, and Ekaterina Zaytseva presented their papers at the Learner Corpus Research conference in Cuijk, the Netherlands, amongst others. Marcus Callies edited a volume on “Learner corpora in language testing and assessment: Prospects and challenges” together with Sandra Götz from the University of Gießen, Germany, and the newly launched International Journal of Learner Corpus Research edited by Marcus Callies and Magali Paquot has seen the successful publication of its first two issues boasting high-quality contributions to the field. (For a detailed overview of the CALE team’s presentations and publications, see Presentations and Publications). 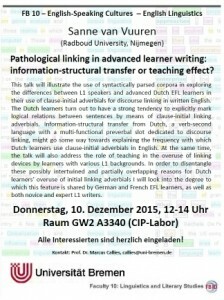 Work on two new PhD projects in the field of learner corpus research – Nida Dusturia’s and Leonie Wiemeyer’s, both of which are being supervised by Marcus Callies – has also begun in 2015. We hope that 2015 has been equally exciting for you and wish you all happy holidays, a relaxing (or productive, whichever you prefer) winter vacation and a great start to a healthy and successful new year 2016! Best wishes from the CALE team! 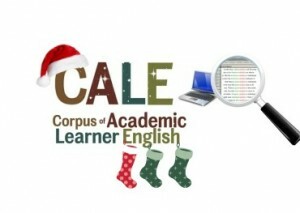 As of December 2015, information about the Corpus of Academic Learner English (CALE) can be accessed through this blog. The CALE is an English-for-Academic-purposes learner corpus currently being compiled in the context of the research project “Lexico-grammatical variation in advanced learner varieties”.